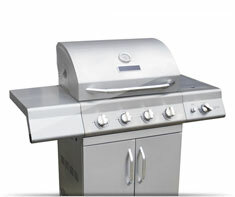 A gas Barbecue Grill is an outdoor cooking grill that burns either natural gas or propane. If a gas Barbecue Grill uses propane for fuel, then it can either be moveable model with a small tank of propane, or it can be a stationary model with the propane delivered through piping from a larger propane tank located somewhere on your property. If a gas Barbecue Grill uses natural gas for fuel, then it needs to be a stationary model. If your barbecue grill uses charcoal rather than gas, then you should instead put a checkmark for 'Barbecue Grill (charcoal)' in your Home Wizard app if you have a full-size grill, or 'Barbecue Grill (hibachi)' if your grill is a small portable charcoal model. Shown in the 'Routine Care' section are the recommended routine maintenance tasks for your barbecue grill (gas). The 'Q & A' section shows answers to common questions. And the 'Articles' section provides helpful articles about your barbecue grill (gas).